Dong Ba is the biggest commercial center of Thua Thien Hue Province and the adjacent regions. It stands along the north bank of Huong River, on Tran Hung Dao Street of Hue Cityand stretches from Trang Tien Bridge to Gia Hoi Bridge. 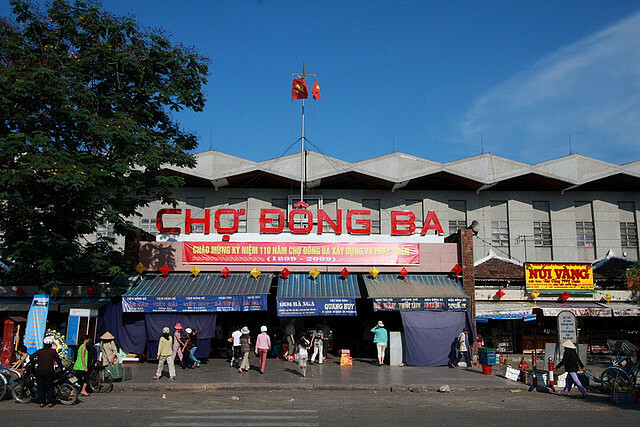 Before the opening of Dong Ba Market, there was a grand market named Qui Gia Thi outside of Chanh Dong Gate in the reign of King Gia Long. The name Qui Gia Thi referred to the return of Nguyen Dynasty to Phu Xuan (Hue nowadays). In the summer of 1885, the capital city was attacked and Qui Gia Thi Market was burned to ashes. Not until 1887 did King Dong Khanh rebuild the market and rename it as Dong Ba Market. Since then, the market has functioned as the main resource of food for the palaces, hospitals, army camps and dormitories of the national universities such as Quoc Hoc, Dong Khanh, Binh Linh, Thien Huu, etc. in 1899, during the Western-style reconstruction project of King Thanh Thai, the market was moved to the nowadays position. Even though Dong Ba Market has undergone several projects since the beginning of the 20th century, nowadays, it still embraces many old features. When visiting Dong Ba Market, tourists can easily spot the old bell tower standing proudly amidst the complex of buildings. With nine new buildings and four new sections ranging from seafood to clothes, the market reaches an area of up to 16,000 m2. However, the architecture is not really a highlight but the atmosphere and the daily pace of the market itself. Similar to most of Vietnamese markets, this one is divided into different sections, depending on the types of products. The whole floor upstair is for garment and clothes. All of the most special cultural gifts and souvenirs of Thua Thien Hue that remain until today can be found in Dong Ba Market. They include “non la bai tho” (conical hats having poems woven into their design) from Phu Cam Village, which is made of latanier leaves; me xung (candies), Truoi berries, Tuan tea, tom chua (Hue Sour Shrimp), lotus seed of Tinh Tam Lake, etc. Traditional food such as mussel rice, beef vermicelli, leaves cakes, etc. can be purchased in the market, too. It’s said that Dong Ba Market is where people can get most of Hue’s delicious dishes within a place – its food courts, and at a high quality standard. Don’t miss these street vendors on the ground of the market (under the stair). They’re really worth a try. Nowadays, Dong Ba Market still holds an important position in the economy and trade of the city, though many supermarkets have been established. Apart from providing food and other goods for the cities, it’s also a must-stop of visitors to discover typical trading methods as well as buying some specialities of the local people. Bargain, bargain and bargain! It’s the first tip at Dong Ba Market that even local residents have to apply. Few sellers can speak English fluently, but it doesn’t matter since they can say the number and use the calculator. Start bargaining from half the price, especially if you’re foreigners. Buying in bulk will help visitors when dealing with the sellers. If one’s lucky and good at bargaining, Dong Ba Market can offer the best price since Hue’s cost of living is quite cheap. You can learn more about bargaining in Vietnam here. The market begins at early in the morning. From about 3.00 AM, some sellers, especially of food stalls, have to arrive at the market. Interestingly, the morning market is a special scene, where people buying and selling in the dim light and the silence, freshness of the city. At this time, local residents can purchase freshest food at a lower price. The market opens all day long, till 8.30 PM. The average number of consumers visiting the market daily is 5000 – 7000 people and can double during big holidays. On these occasions, visiting the market is really exciting since the scene of trading is very busym though tourists must be aware of pickpocketing. Also, avoid coming there on the first day of the Lunar New Year since a very few shops are opened. Normal operations often fully restart after the third day of the New Year. There’s a bus station inside the market where tourist buses often park. Thus, it’s convenient for travelling there by bus or car as well. However, the most interesting way to visit Dong Ba Market must be by cyclo. Some local people even travel there by boat, starting from Vi Da Boat Station. This is really interesting, though tourists aren’t advised to do so as the safety standard is not guaranteed.